Former Jammu and Kashmir chief minister Omar Abdullah has condemned the killing of a tourist hailing from Tamil Nadu during stone pelting incident in Narbal area on Srinagar-Gulmarg road. Omar also lashed out at the state government saying the Peoples Democratic Party-Bharatiya Janata Party ruling alliance was a failure. 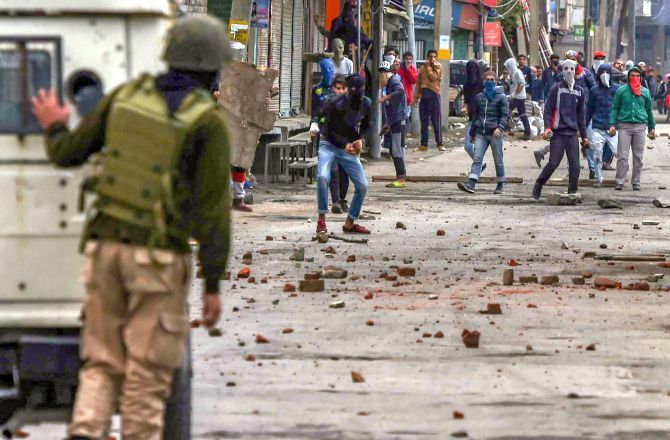 A 22-year-old tourist, R Thirumani, from Chennai was critically injured in a stone pelting incident at Narbal on Monday morning. He was shifted to a hospital for treatment but succumbed to injuries, police said. “The J&K Govt has failed, the CM (Mehbooba Mufti) has failed, the BJP-PDP alliance has failed. How much blood will have to be shed in Kashmir before the Hon PM (Narendra Modi) realises the gravity of the situation in J&K? When will enough finally be enough?” he asked. Reacting to the incident, Congress leader P Chidambaram asked Chief Minister Mehbooba Mufti to quit the PDP-BJP coalition government saying the “unholy” alliance was the gravest provocation to the people of the Valley. In a series of tweets, the former home and finance Minister claimed the “muscular and militaristic” approach of the central government has driven the state towards the present “catastrophic” situation. “Mehbooba Mufti should break her party’s unholy and opportunistic coalition with the BJP. And go back to the philosophy of her father. “The PDP-BJP coalition is the gravest provocation to the people of the Kashmir valley. Mehboobaji, quit the coalition immediately and go back to the people,” he said. Chidambaram said he shared the Jammu and Kashmir chief minister’s concern that statesmanship required to get the state out of the vicious cycle of killings but it was sad that she does not see that her coalition government is the core of the problem. “The central government’s muscular, militaristic approach to the J&K issue has driven the state towards the present catastrophic situation,” he said. Mehbooba on Monday had urged the national leadership to show the element of compassion and display the statesmanship to get Jammu and Kashmir out of this “vicious cycle of killings”.